You are here: Home / Blog / Make this easy ladder laundry drying rack! 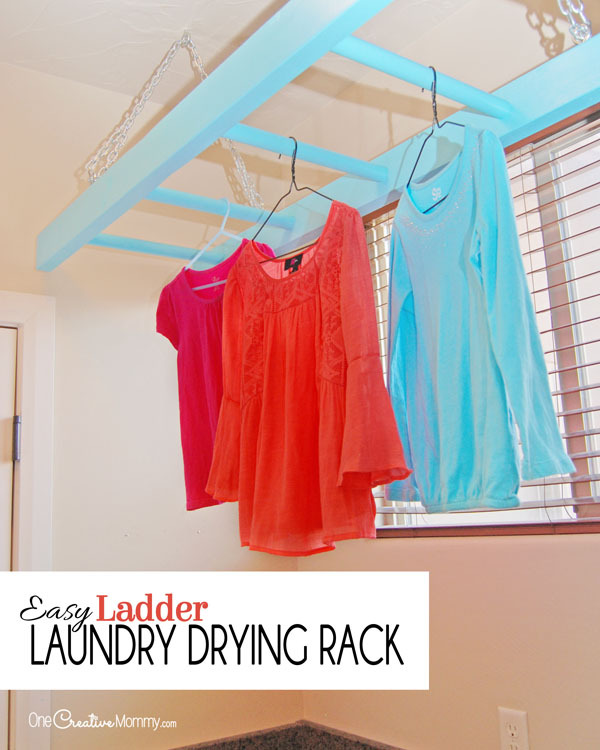 Make this easy ladder laundry drying rack! Many people could probably hang a few hooks, and that would be enough for their drying needs. Most people could hang a shower bar, and that would work, too. A few hooks would not cover it for me. I hate it when clothes shrink, so I air dry shirts for almost the entire family. That means lots of wet clothes, every week. As for the shower bar? It would work, but I want something a little more fun. I’ve been wanting to make this since I first saw it on Little Lucy Lu several years ago. She made hers from an antique ladder–the kind with round rungs. Well, guess what? You have to be really lucky to come across a ladder with round rungs. I’m not that lucky, so I had to figure out how to make my own. Guess what? It’s super easy! The length of the materials you will need depends on the length of the space you’re trying to fill. I created a 5′ ladder, so I’ll give you measurements that match a 5′ ladder. 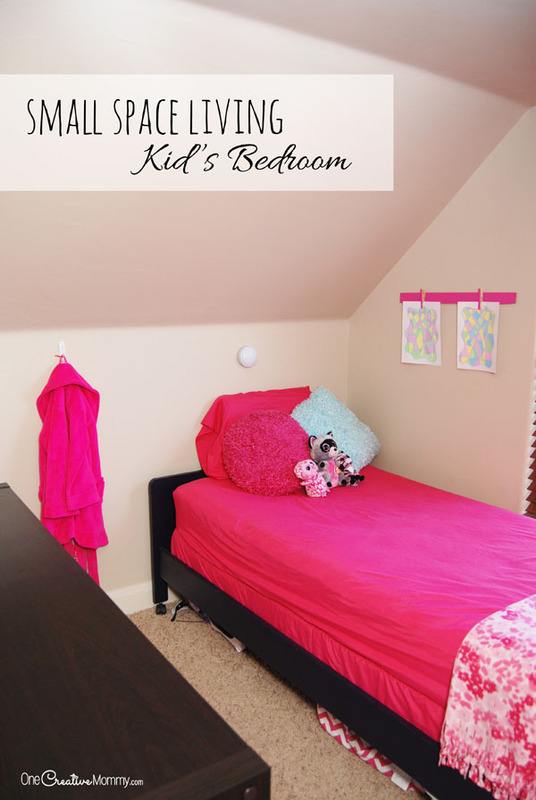 Adjust the measurements to match your space. 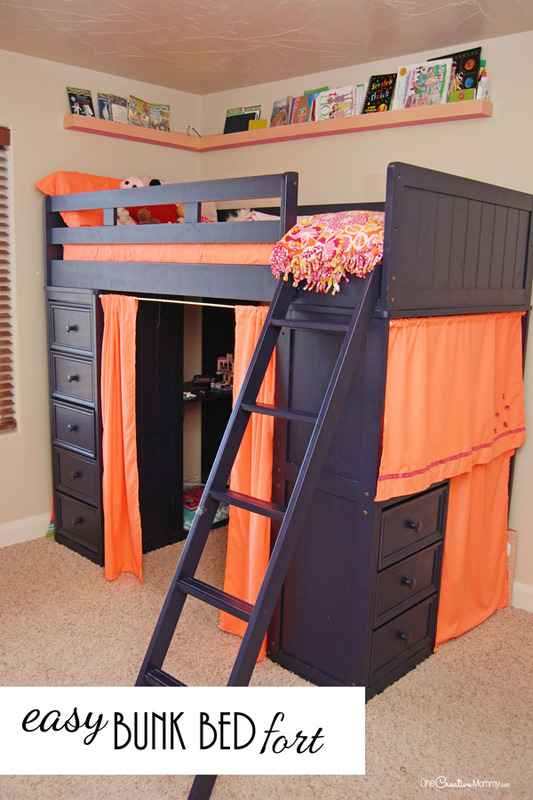 2 – 4′ x 1 1/4″ wooden dowels (Each cut into 3 – 16″ pieces) For a 5′ ladder, you will have one extra piece when you are done. 2 – lengths of chain – The length will vary depending on how low or high you choose to hang your ladder. Make sure to choose a link size that fits inside your screw eyes and quick links. Ready to get started? Here we go! 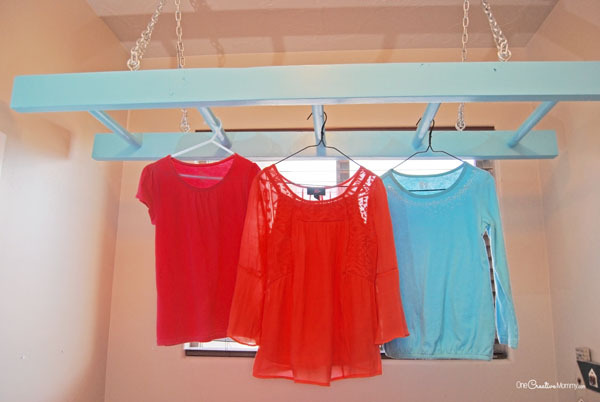 You’re not going to believe how easy it is to make this hanging ladder laundry drying rack! The drilling isn’t as hard as it looks, but it does take a steady hand to keep the drill straight. My hubby did the drilling, and I just tried it out for fun on some scrap wood. I had a hard time keeping the drill straight. If you are a novice like me, plan to practice on some scrap wood first. 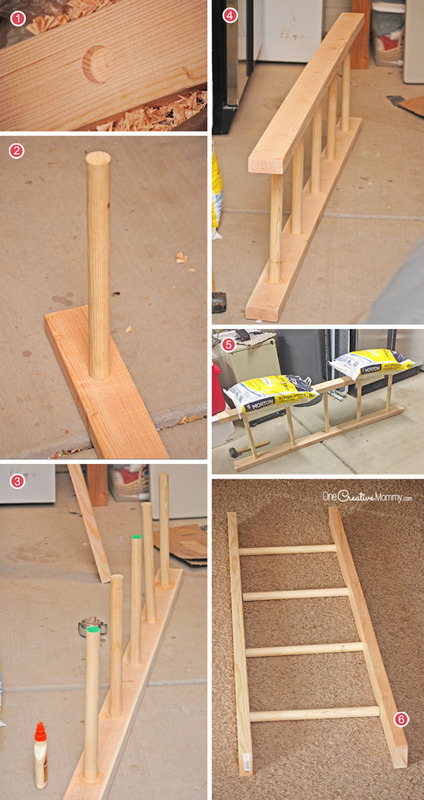 Follow the directions on your wood glue for gluing the dowels into the holes on one side of the ladder. Lay the second side of the ladder (the one you have not glued yet) on the ground. Place glue in the holes and glue on the ends of the dowels sticking out of the first side of the ladder. Invert side one and push the dowels into the holes in side two. Once you’re drying time is done, you’re done! Can you believe how easy that was? Since I totally made this up from scratch, I was pretty shocked. 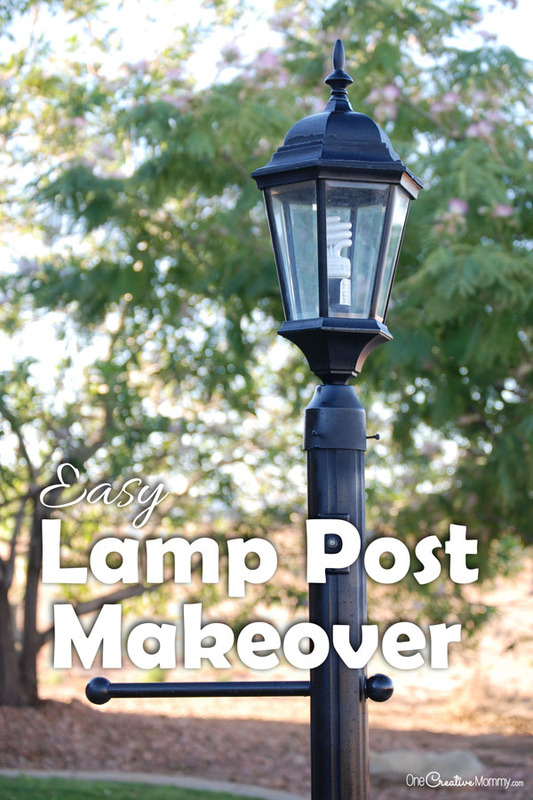 Go sand and paint your project, then come back to find out how to hang it. See you back in a little while! I painted mine Rapids by Valspar (the same color I painted these DIY Storage Lockers), but now I’m wondering if I should switch to a nice lemon yellow. Hmm. Maybe I’ll change it up in a year or so. Done painting already? Here we go! * Very important!! When you screw the screw eyes into the ceiling, be sure you screw into a stud!! We used a stud finder and then tested with a small nail to be sure we had really found a stud before we drilled. Carefully measure and attach a screw eye centered above each side of the ladder (directly above and centered between the screw eyes on the ends of the ladder). The screw eye should run parallel to the sides of the ladder. Attach a quick link to each end of both lengths of chain. Thread the chains through the screw eyes in the ceiling, leaving the ends dangling. While someone holds up the ladder, thread one end of each chain through a screw eye on the ladder, and secure the chain at the desired height with the quick link. You could save a little money and use hooks instead of screw eyes and quick links. (The quick links are almost $2 each.) I went with the more expensive option because the ladder is above my head, I’ll be hanging lots of heavy stuff on it, and I don’t want the chain to accidentally get knocked off the hooks and have a heavy ladder fall on my head! Safety first! What do you think? Will you make one? How do you avoid hanging wet laundry all over the house? Thanks for stopping by today. Check out more home projects by clicking on the images below. This is pretty awesome. I wish I had seen it sooner, we had an old ladder that we threw away. We didn’t think we could do anything with it. Thanks, Crystal! I always seem to throw things away and then want them later. It’s Murphy’s law, I guess.